Infiltrate a militant temple of Tyr to recover a magical artifact in this heist adventure for 11-16th level. A review copy of The Theocracy was provided for the purposes of this review. 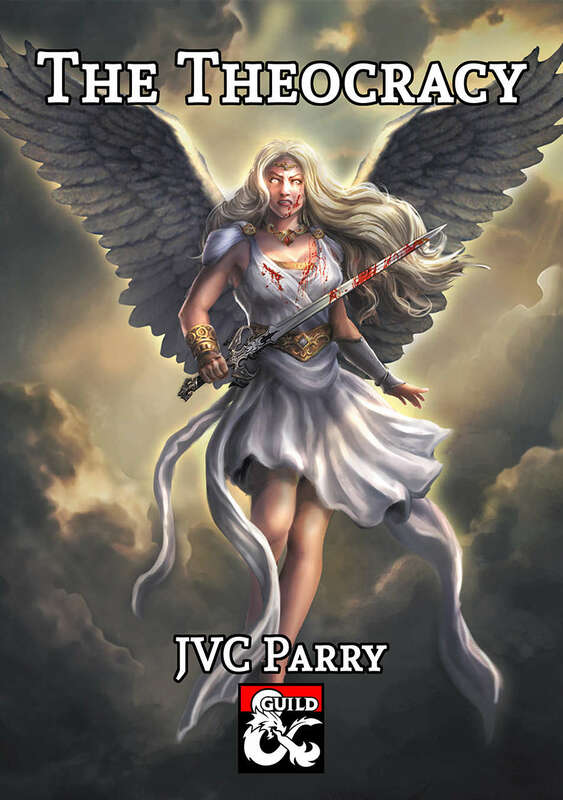 JVC Parry is one of my favorite creators on the DMs Guild. He’s produced many quality one-shot adventures with neat ideas and well-designed miniature dungeon crawls. “The Theocracy” is Parry’s latest adventure, and while the actual title is hopelessly generic, it offers a substantially deeper, higher level dungeon crawl with a unique, richly detailed theme. The twist is that the “dungeon” is actually a Temple of Tyr (the Forgotten Realms’ militant God of Justice), and the PCs are tasked with retrieving an important magical item – hopefully without declaring war on a bunch of paladins, priests, and a gods damn angel. Like any good one-shot, the adventure can be placed within any city in a DM’s existing campaign; Parry suggests Baldur’s Gate in the ever popular Sword Coast region of the Forgotten Realms. “The Theocracy” is a bit higher level than most of the content I’ve seen on the DMs Guild, with a suggested level range between 11th and 16th (Tier 3). Unfortunately there aren’t any notes for scaling it any lower, but obviously replacing the custom-built high-CR NPCs (like the CR 7 Theocratic Paladins) with more generic foes from the Monster Manual (like CR 3 Knights) would be a start. 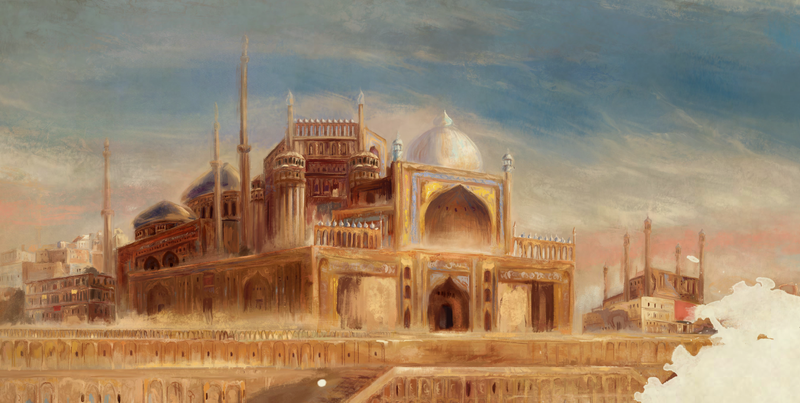 The adventure is divided into two parts, with an introduction that provides some story hooks for getting your PCs on board with infiltrating a militant holy temple in the middle of a city. Most of them involve acquiring a powerful legendary artifact, the dragonfall horn, which is currently locked away by our titular sect of Tyr. There’s a nice bit of history on the dragonfall horn that I enjoyed reading about, and it would play especially well in a dragon-themed adventure such as the Rise of Tiamat. But the horn ends up being a complete McGuffin. It has no real bearing on the adventure other than your PCs being hired to get it. It doesn’t get any special notes or statblocks at the end, though on the flip side you could easily replace it with whatever special item works in your campaign. “The Theocracy” is a heist mission, or at least begins like one. Most PCs aren’t going to want to declare open war on a church of Tyr and turn a seemingly good-aligned temple into a bloodbath. Part 1 is all about canvassing the area as the PCs gather as much information about the group and the physical space of the temple. 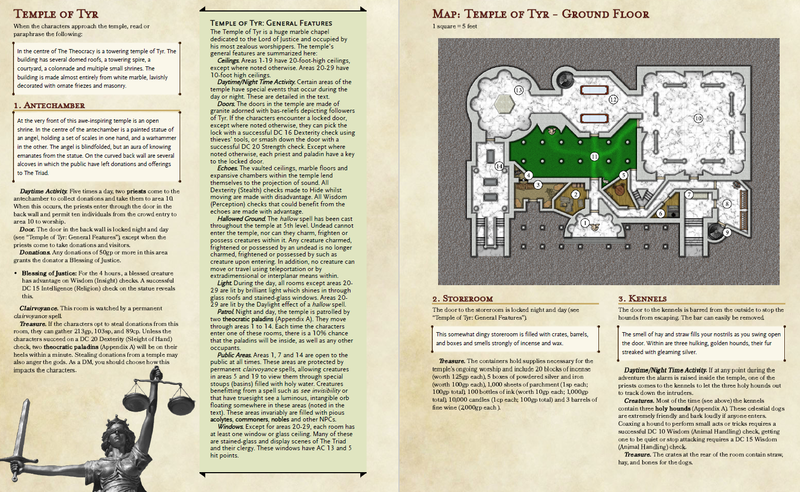 This section is well-organized and provides detailed notes on what areas of the temple are open to the public, as well as introducing a sect of the Harpers that the PCs will most likely be working for in their mission. The Temple of Tyr is gigantic, and fully broken down in part 2. It consists of three levels for a total of 29 rooms. Every single room is given its own read-aloud descriptive text and notes, including any creatures or treasures. If you’ve read any officially published Fifth Edition books you’ll feel right at home with the professional format. The artwork, including the colorful, detailed grid maps do a wonderful job to visualize the temple and its denizens. I particularly liked seeing notes on patrols and daytime versus nighttime activity for most rooms. Since this is a heist/stealth mission, NPC day-to-day actions become doubly important. The Tyr-flavoring is richly themed and felt throughout the entire area. It doesn’t get much holier than a large-scale temple. Inside you’ll find patrolling paladins, winged holy hounds, protective stone angel statues, and an interrogation room permanently under the effect of the Zone of Truth spell. An underground prison is also home to a few fun characters, including an invisible imp who chafes at being under the temple’s control, and a captured rakshasa with whom the PCs could form a tenuous alliance with. The final barrier to the horn involves a neat little puzzle that would feel right at home in a point and click adventure game. While it’s technically a heist mission, the Theocracy isn’t exactly altruistic. The High Theocrat has a nice backstory that puts her at odds with any arcane magic. She has outlawed magic and banned the worship of any other gods outside Helm, Tyr, and Ilmater. The PCs could definitely end up going to war with the whole temple if they choose. If I were running this adventure I would layer the Theocracy’s more extreme views below ground, letting the PCs discover them and make the choice if they want to continue the smash and grab, or seek out and confront the High Theocrat. She, by the way, is a freaking CR 11 super-halfling paladin with Legendary Actions and a nearby stone guardian angel. Nice! “The Theocracy” is a fun heist-based dungeon crawl that’s easy to slot into any existing campaign thanks to its seemingly mundane setting of a temple. The temple is dripping with appropriately Tyr-themed creatures, loot, and structure, which helps make the large dungeon stand out as a unique and interesting experience. Fantastic art, lettering, and structure made to look like an officially published D&D 5E book. Gigantic, detailed dungeon design with helpful notes on patrol schedules for stealth-inclined parties. Powerful custom-made NPCs that make up most of The Theocracy, run by a CR 11 super-Paladin with Legendary Actions. The Temple of Tyr effectively uses its holy theme in every aspect of the dungeon, from angel statues to winged hounds, precious ornaments, radiant traps, and blessed spells. “The Theocracy” is a lame, generic name. The dragonfall horn, the artifact the PCs are seeking, isn’t given any kind of a statblock or notes. The Verdict: The Theocracy provides a high level heist mission set within a richly thematic, densely packed holy temple of tyr. A press copy of The Theocracy was provided for the purposes of this review.